In accounting, every transaction needs to belong to a Chart of Accounts (COA). In Veryfi, we call this "Category". 3. A modal pops up with a form where you can add a New Tax Code with associated Category Name, Type (Money In or Money Out) and a Budget (as shown below). From the Categories page (https://hub.veryfi.com/categories/), simply press the blue dashed underline link where the Name is to Edit it in place. When done, hit enter (or outside the container) to save it. This icon (above) means more. Press it and you will see MORE options for a specific row (as shown below). In the dropdown context menu you will see an option called "Delete". Pressing it will prompt you whether you want to delete a category. The checkboxes on each row open up BULK OPTIONS (as shown below). Therefore, checking multiple rows will allow you to delete all those selected rows at once as shown below. Try it out. A confirmation window will always prompt you to confirm your action incase it was made by a mistake or as a test. What happens to Documents when I delete their Categories? 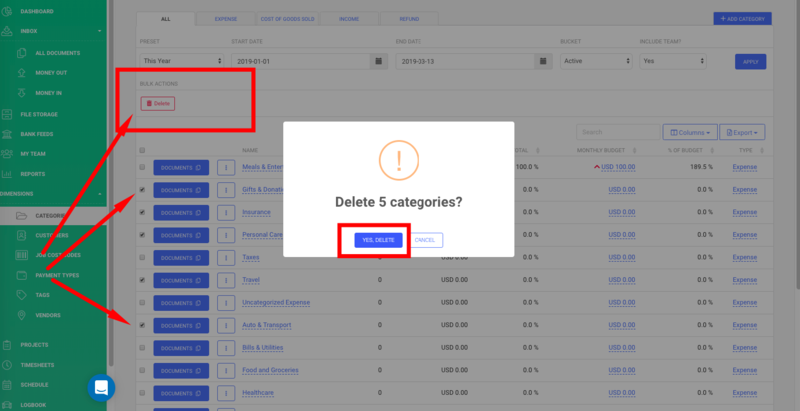 If you Delete a Category(ies) that is/are assigned to one or multiple Documents, Veryfi will automatically unmap those documents from the deleted Category(ies). Your documents will then show a red "Select category" as shown below. If your Veryfi Account is connected to an external Accounting application like QuickBooks or Xero, destructive changes like delete do not sync to your cloud accounting app. 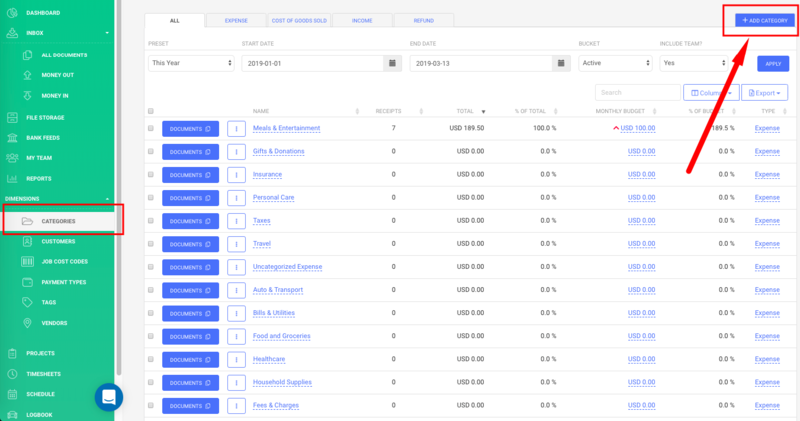 Add a Tag or Category to your email receipts?